The Bilderberg group is an organization of political leaders and international financiers that meets secretly every spring to make global policy. There are about 110 regulars—Rockefellers, Rothschilds, bankers, heads of international corporations and high government officials from Europe and North America. Each year, a few new people are invited and, if found useful, they return to future meetings. If not, they are discarded. Decisions reached at these secret meetings affect every American and much of the world. The roots of Bilderberg go back centuries, when international moneychangers would secretly manipulate the economy to enrich themselves and enslave ordinary people. The Rothschilds of Britain and Europe have met secretly with other financiers for centuries, as did the Rockefellers of America. In the beginning, the Rothschilds were “Red Shields” because of the ornament on their door and the Rockefellers of Germany were “Rye Fields” because of their crops. One of the most significant such meetings took place in the spring of 1908, led by Sen. Nelson Aldrich of Rhode Island, whose family married into the Rockefeller clan, accounting for the late Gov. Nelson Aldrich Rockefeller’s given name. It was held on Jekyll Island off the Georgia coast. The late B.C. Forbes, editor of Forbes magazine, reported what transpired at this meeting of the world’s wealthy. With Aldrich were Henry Davidson, of J.P. Morgan and Co.; Frank Vanderlip, president of the National City Bank; Paul Warburg, of Kuhn Loeb and Co., and A. Piatt Andrew, assistant secretary of the treasury. They emerged from this secret meeting with a plan for “a scientific currency system for the United States.” They had the power to pressure Congress into establishing the Federal Reserve Board, a private group of bankers who meet to shape the money supply. But in 1954, the international financiers decided that the world had become so small, and their interests intersected so often, that they must have regular, annual meetings. That year, they met at the Bilderberg Hotel in Holland, and took the name “Bilderberg” for themselves. They have met behind sealed-off walls and armed guards at plush resorts ever since. Secrecy prevailed briefly, until the late journalist, Westbrook Pegler, exposed Bilderberg in 1957. However, Chatham House rules have remained in effect, whereby meetings are held privately and attendees are prohibited from talking on the record about what transpired. Pegler devoted two of his nationally syndicated columns to Bilderberg in April 1957, although he did not know the group’s name. Pegler reported that Ralph McGill, the late editor of The Atlanta Constitution and Arthur Hayes Sulzberger, publisher of The New York Times, had attended on their promise of secrecy. Since, the publisher and associate editor of The Washington Post, Donald Graham and Jimmy Lee Hoagland, respectively, have been regular participants. All network news channels have attended these meetings. All promise to abide by the rule of secrecy. Bilderberg, which typically meets at a luxury resort near a small town, provides a short “press release” to the local paper—preferably a weekly. It is designed to reassure natives as armed guards arrive, motorcades roar by, yachts dock and helicopters land, delivering unidentified people behind closed-off walls. The “press release” is the same each year; only the site and dates are updated. It says individuals will meet privately to do nothing for three days. Otherwise, they try to impose a complete blackout. The blackout is virtually complete in the United States. When giant newspapers and broadcast outlets say they do not want the word “Bilderberg” to appear, the pressure on Associated Press is obvious; they are the biggest customers, paying far more than a small-circulation local paper. Small-city papers depend on AP for all out-of-town news, even for their state legislative coverage. They run hard to stay ahead of the city council and high school football team. Unless informed directly, they have no knowledge that Bilderberg exists. While Bilderberg denies its meetings are significant, the record proves otherwise. The now-defunct Spotlight wrote advance stories on the end of the Cold War, the downfall of Margaret Thatcher as prime minister of Britain and of President George Bush the Elder’s breaking of his pledge to not raise taxes based on what transpired among Bilderbergers. More recently, while the mainstream media in 2002 was asserting that the invasion of Iraq would come by late summer or early fall, AMERICAN FREE PRESS reported that there would be no aggression until 2003. The war began in March 2003. Learning what transpires at Bilderberg can provide a glimpse of what the future holds. Bilderberg: Conspiracy ‘Theory’ or Fact? • They meet at a secret location each spring, normally in late May or early June. Their exclusive resort will be sealed off at high noon on the Wednesday before Bilderberg starts meeting on Thursday through Sunday. The resort will be emptied of all non-Bilderberg people. Armed guards will seal off the resort to prevent anyone from approaching. Chasing Bilderberg for 37 years has been the most exciting assignment of my lifetime newspaper career, the first 20 years of which were in the mainstream press. I had held some high positions—night editor of the now-defunct Washington Daily News, editor of the Martinsville, Va. Bulletin, copy editor at the Richmond, Va. Times-Dispatch and, finally, assistant news editor of the Akron, Ohio Beacon-Journal. So a moment that came in the spring of 1975 is forever photographed in my mind. I was being interviewed by Willis Carto for the job of starting a newspaper to be called The Spotlight. Carto was officially “treasurer” of Liberty Lobby but he was more than that. He was Liberty Lobby, having founded the populist institution in 1955. He asked me what I thought of Bilderberg. I had never heard of Bilderberg. He gave me a brief oral summary and a lot of Liberty Lobby’s research material to examine. The materials contained not only the institution’s newsletters—Liberty Letter monthly and Liberty Lowdown —but also copies of the columns of the late, great newspaperman, Westbrook Pegler, who had first observed these mysterious meetings from afar and written about them in the 1950s. I was dumbfounded. How could I have spent my adult life with Associated Press, United Press International and other newswires ticking at my ear, and serve on newspapers with far-flung staffs across the globe and not know of these characters? The Daily News had been a Scripps-Howard newspaper; its headquarters on the same 3rd floor as the News’s staff. Scripps-Howard covered the world. I edited its copy for the News and had much communication with the Washington staff of Scripps-Howard. And that was the year—1975—that started my career as the only reporter who, for nearly four decades now, has worked earnestly to hound this secret meeting of the world’s most powerful businessmen, powerbrokers and politicians and expose it to the light of public scrutiny. I soon learned that Bilderberg had recruited the media moguls into its secret conspiracy and dictated an absolute blackout in the United States. There was much Spotlight-generated and now AMERICAN FREE PRESS-generated Bilderberg publicity in Europe, but the near total blackout in the United States persists. Bilderberg is a powerful assembly of the world’s leading financiers, industrialists and political operatives. It includes such internationalists as banker David Rockefeller, heads of state in Europe and high officials of the U.S. government—White House, Defense, State, Congress and others. Past U.S. presidents—Bill Clinton and Gerald Ford—have attended Bilderberg. But a sitting president cannot because White House paperboys are given his complete schedule each day—the size of a paperback novel, accounting for every minute. Even his schedule on “working vacations”—the only kind a president takes—is provided. There is no way a president can disappear for three days without accounting for himself and if a sitting president attended Bilderberg, even the controlled media would be hard-pressed to explain away the president’s absence from the limelight, hidden behind the locked gates of the Bilderberg meeting. High officials of The Washington Post, The New York Times, and Los Angeles Times and of all three major networks have attended Bilderberg many times, on the promise of secrecy, to report nothing and to not use the word “Bilderberg.” Except for some minor, inconsequential accidents in which the word “Bilderberg” has suddenly appeared in print—after all, you can’t call a staff meeting and tell all 900 New York Times news staffers about the blackout—the promise has been kept. Four times the word slipped into The Washington Post—which has been represented by successive publishers since Bilderberg’s first meeting under that name in 1954. One came in a worshipful profile of Bilderberg luminary Vernon Jordan. In another instance, in a multi-part profile of then-Vice President Dan Quayle, the fact that Quayle had attended a Bilderberg meeting was mentioned in passing, buried deep in one of the articles in the series. Another came in an inside-page story celebrating how Austria was being economically penalized for holding a fair election in which Joerg Haider’s Nationalist Party enjoyed significant gains. In a laundry list of important meetings that had been scheduled for Austria, but changed, the Post mentioned Bilderberg—but said it had been moved to France when it actually would take place in Belgium, outside Brussels. Then, in a Dec. 3, 2004, obituary for Prince Bernhard of the Netherlands, the Post said: “He is also credited with establishing the Bilderberg Group—a secretive annual discussion forum for prominent politicians, thinkers and businessmen, which he chaired from 1954 to 1976.” The Post made no mention of its own long-standing involvement in the secretive international body. And in 2005, Va. Gov. Mark Warner’s attendance at the Bilderberg meeting in Germany was written up in a series of reports across Virginia. Warner is a Democratic governor in a state that has gone Republican since 1952, with the exception of 1964 when Lyndon Johnson trounced Sen. Barry Goldwater (R-Ariz.). His presence signals that the global elite considers him to be a potential president. Warner, respecting the rules of secrecy, kept the trip off his public calendar. When an Associated Press reporter heard an off-guard comment, Warner admitted attending but refused to divulge information. AP was given the AMERICAN FREE PRESS edition that carried Bilderberg details and the list of participants. Bilderberg and its brother group, the Trilateral Commission, are good at picking future presidents. Actually, they like to own both horses in a two-horse race. Here is the line-up: Jerry Ford, Bilderberg; Jimmy Carter, Trilateral; President Bush the Elder; Trilateral and Bill Clinton, Bilderberg. How can such a near-total blackout be imposed on what were, not so many years ago, 1,800 daily newspapers (now down to 1,200) in the United States, all of which thump their chests as protectors and practitioners of freedom of speech? When the major newspapers are intimidated, it affects all papers and the wire services. Most of the nation’s newspapers depend entirely on the wire services for news outside their own cities—state, national and world. If Bilderberg is not on the wires, the local editors are as ignorant as I was for 20 years. They work hard to stay ahead of the city council, high school football team and all local news. Similarly, small broadcast outlets depend on their wire services and network affiliates which, in turn, also depend largely on wire services. Wire services operate like farmers’ co-ops. Big-city newspapers pay many times as much for the services as small-town papers. When they tell the wire services to keep silent on Bilderberg, the pressure is obvious. Newspaper participants go to any length to keep their vows of silence. It’s a heady experience for these journalists to clink cocktail glasses with the rich and famous. They do so at the price of the credibility of their own newspapers. A recent example came at the Bilderberg meeting in the spring of 2002 at Chantilly, Va. At that time, The Washington Post and the entire mainstream media were predicting that the U.S. invasion of Iraq would come “in the late summer or early fall.” But, to appease Europeans who opposed the invasion, Secretary of Defense Donald Rumsfeld assured Bilderberg that the invasion would not come until the next year—2003. Jimmy Lee Hoagland, associate editor and columnist at the Post has escorted his publisher to Bilderberg for years. He had to hear Rumsfeld’s assurances. But he let his own newspaper continue with the “late summer or early fall” prediction, knowing it was wrong. He would not even steer his paper straight on the pretense of getting the information elsewhere—too much risk. But covering Bilderberg is more than a spring adventure—it is a year-round operation. Two of the most significant Bilderberg exposés occurred during the “off-season” and in unlikely ways. In March 1985, The Washington Post carried a few lines of type in its society section, noting that David Rockefeller and Henry Kissinger had a meeting with Mikhail Gorbachev, head of the then-Soviet Union. The Post described the meeting as productive, and that was all. A check of the Soviet-controlled media revealed enormous details. Rockefeller and Kissinger had told Gorbachev they were sympathetic with the economic stress suffered by the Soviet Union and could arrange for U.S. financial aid to its puppet state of Poland if Americans could observe a “free election.” So it was arranged that Poland would have a “freely elected” national legislature with only one-third of the seats reserved for the entrenched Communist Party. Could you imagine a U.S. election where one-third of Congress is reserved for only Democrats or Republicans? Another one-third of the seats were reserved for the Peasant Party, a wing of the Communist Party that had voted in lockstep with the Kremlin’s dictates for 40 years. But when the “election” was over, young Turks in the Peasant Party seized the moment and voted with members who were truly freely elected to form the government, ousting the communist regime. The fires of freedom then swept Eastern Europe, bringing an end to the Cold War. Based on this information, the still-flourishing Spotlight did an advance story on the downfall of communism in Europe, long before the mainstream media had a hint. Every year as The Spotlight and now AMERICAN FREE PRESS have pursued Bilderberg, readers have learned what to expect in advance of the mainstream media because those who know are under a vow of silence and the others are ignorant. It was Spotlight readers who turned the beam of publicity on Bilderberg in the European media. That year, 1994, we learned early that Bilderberg would be meeting near Helsinki, Finland. European readers inquired if they should alert the media and the answer was a quick “yes.” The result was extensive press and broadcast coverage that stunned Bilderberg luminaries. Bilderberg has suffered extensive coverage in Europe since. However, media and security control is so tight in the United States that readers have had only limited success in exposing Bilderberg here. Having built a track record of history confirming our reports, the Washington press corps has become intensely interested in what it cannot report. 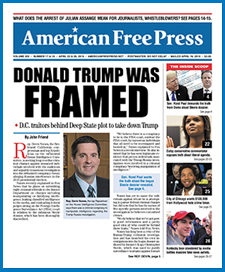 After each Bilderberg meeting, I carry a load of copies of AMERICAN FREE PRESS containing Bilderberg reportage with me to hand out to reporters who can’t report. Many tell me directly that they consider the mainstream cover-up a scandal. James P. Tucker, Jr. is the world’s foremost expert on the global elite. Tucker is AFP’s editor emeritus and the author of Jim Tucker’s Bilderberg Diary. 7 Comments on What is Bilderberg? Bilderberg is just another secret circle (ring); but which ring control all the other rings? This chart may help put the Bilderberg Group in its proper perspective. And also notice in spite of the fact that Obama, Clinton, Romney, McCain and a bunch of people are listed, TRUMP IS NOT! Maybe this is part of the reason he is being slammed so badly by the drive-by media. To have a group of special individual with such influence in today’s world society, using their strengths in finance, industry, in all other facets associated with the world living populations makes for the CARTEL created with most all paying to build and support their power through MONEY. This in essence supports the theme of the Democrat Senator Bernie Sanders telling the voters it is the Wall Street bankers whom have broken over time and means to wreck any living earned standard of living called the middle class. Some of those mentioned in attendance of these annual secret meetings from the USA, David Rockefeller, Hillary Clinton, Bill Clinton, David Petraeus, Henry Kissinger, Gerald Ford, Jimmy Carter, George H. Bush, John Kerry, all of whom seem to have and axe to grind for their own uppity leader ship and financial benefit. It’s all money to maintain their influence and position and place in the society they claim to have earned. When they own and control all types of informational world control flow, this violates the United States Constitution of free speech. And the USA make way for certain invited persons to attend. This society group should be outlawed, and/or their program placed into each ones own country for the benefit of their own kind and population. Very interesting and convincing article indeed. Hard to believe that some still consider Bilderberg insignificant! I pray we all are not blind and the rich will suffer. I think it’s time to stop the Federal Reserve banks and the f***ing banksters that are ruining our lives. Bilderberg is Yiddish-German slang for “building up the Zionist mountain of god.” Berg is in Yiddish-German-Mountain. Just like Bergoglio, the Argentinian Yiddish “Pope” (Highest Rabbi) in Vat-i-Can, Rome. Stein or Berg is a pure Yiddish name, just as Montagna or Piedro (Rock), Monti in Italian, and so on. Kopecky or Skalisty in Slavic names-all Yiddish Talmudists and Khazars. And they all Bild (Build) their Mount Zion “throne of god” for themselves, to be worshiped by us the ‘goyim’ as our “god and gods-ubermensch.” The false and phony “religions” is one way to build their Mount Zion, and masonry-political-economical sphere is the other one way to their Mount Zion.